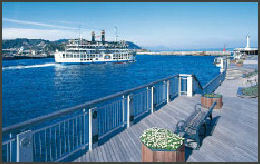 Miyazaki (3 hours south of Beppu) is an industrial city with 300,000 people and warm climate. Many of the city's sights are associated with the mythological creators of Japan. They include Miyazaki Shrine, dedicated to Jimmu, the first emperor of Japan. Many of early events of the Japanese creation myth take place in Miyazaki. Heiwadai Park contains ancient mounds believed to be occupied by some of the first members of the royal family, and the 120-foot-high Peace Tower is an ugly structure erected in 1940 just before the beginning of World War II .Haniwa Garden (near Heiwadai Park) houses 400 replicas of ancient clay figures are found in the tombs. Near Miyazaki is dizzying 250-meter-long, 42-meter-high Aya-Teruha suspension bridge over some of Japan's oldest forests; Takachiho, a mountain resort near Takachiho Gorge; and Amano Yasugawara Cave, where the sun goddess hid and was lured out to perform a sacred dance. Saiobaru Burial Mounds Park (near Miyazaki) contains 380 ancient burial mounds, the largest such site in scale and number in the country. Made between the 4th and 7th century, the tombs ranges size from small rises to large hills and includes unusual keyhole-shaped mounds. A small museums displays jewelry, armor, swords, haniwa pottery figures and other objects found in the tombs. closes Seagaia Ocean Dome Seagaia Resort (near Miyazaki) was billed as the world's largest indoor water recreation center. One hundred meters wide, 300 meters long and 38 meters high, it featured a huge 10,000-person wave pool, artificial beach made of crushed Chinese marble, bikini clad girls, a man-made volcano that erupted every 15 minutes, and a variety of slides, shops and snack bars. In the wave pool, waves up to eight feet high are generated by a wave machine with 40 computer-controlled vacuum chambers. Underneath the blue sky painted onto the complex's ceiling (which slides open in nice weather and is the world's largest retractable ceiling) are man-made clouds, which slowly drift by. Ironically the ocean is only a few minutes away. 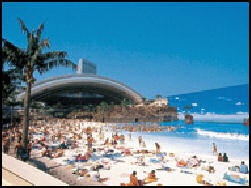 Seagaia resort was conceived in 1988, during the height of the Bubble Economy. Built at a cost of $2 billion, it opened in 1994 and for a while was Japan's fifth largest theme park after Tokyo Disneyland, Universal Studios Japan, DisneySea and Huis Ten Bosch. Seagaia planners expected the project to show a profit its first year based on the assumption it would attract 5.5 million visitors. It only attached 2.7 million its first year and 3.86 million the second year, which was not enough to make it profitable. By 1999, the resort owed more than $1.2 billion and its bank refused to lend it any more money. In 2001, Seagaia filed for bankruptcy and it was sold to the management company Ripplewood LLC. Nichinan National Seacoast Park Nichinan National Seacoast Park extends for 60 miles along the coast. It is celebrated for its luxuriant tropical and subtropical vegetation and mild climate, caused in part by the warm Black Current that flows up from Okinawa and is found off the coast. Cape Toi is known for its herd of "wild" horses. Aoshima Island (south of Miyazaki) is a tiny islet know for its dense groves of betel nut palm trees as well as 200 other different kinds of plants. During low tide a five mile section of seashore with washboard layers of rock and other formations caused by eroding wave action are exposed. These are known as the Devil's Washboard (Oni no Sentaku-Ita). The town of Aoshima is a tourist trap with cafes, hotels and amusement arcades. It attracts lots of Japanese tourist and weekend surfers. Near Aoshima is the prefectural Plant Garden and Cactus Park (with over a million cactuses of different species). Udo Jingu Shrine (near Nichinan 20 miles south of Aoshima) is located in a large sea-eroded cave on the Pacific Ocean at the tip of Cape Udo. It is dedicated to the mythological father of the mythological first emperor of Japan. 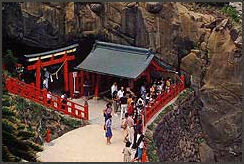 The brightly-painted orange-red shrine is reached by a staircase that clings to a rockface and is flanked by bright red-and-orange banisters. Visitors to the shrine but five clay balls for ¥100 and throw them at a statue of a turtle. Women throw with their right hand and men throw with their left. Hitting the turtle is said to bring good luck. The custom was dreamed up by a PTA at a local school in 1954. There is also cave with a pair of breast-shaped rocks that young mother pray at for more milk. Kojima Island (near Nichinan) is famous for it troupes of wild macaques who wash their food in both saltwater and freshwater and separating grains of rice from sand by cleverly throwing them into the water and collecting the rice grains, which float. Obi (one hour by train from Miyazaki) is a good place to escape from busy Japanese life. Visited by a relatively small number of tourists, it is located on an inland section of the Udo headland on the Nichinan Coast. The main attractions are old houses, plaster storehouses, stone walls and "borrowed view" gardens that incorporate distant mountain. The castle was destroyed in 1870. Only it walls have been rebuilt. Kagoshima (southern Kyushu, 2½ hours from Miyazaki) is known to Japanese as the Naples of Japan, a reference to the city's nearness to smoking Sakurajima volcano, which is comparable to Naples's nearness the active volcano of Vesuvius. With that said, Kagoshima is a wonderful town with hot springs, gardens, a lively nightlife, pleasant climate, friendly atmosphere and 540,000 people. Kagoshima also has a long history of looking outward and defying the Japanese establishment. It is where St. Francis Xavier came ashore in 1549 and near where the first Europeans (shipwrecked the Portuguese) arrived in Japan in 1543. The Kagoshima-based Shimazu clan played a major part in bringing down the last shogun and setting in motion the events that led to the modernization of Japan. Kagoshima doesn’t have that much in the way of tourists other than Sakurajima volcano but it is nice place to stay for two days (one day at Sakurajima and one day checking out Kagoshima). The streets and the sidewalks are wide; the city is easy to get around in; and restaurants and bars offers things like black pork and soju liquor. There are some beaches and good fishing spots in the heart the city. By one count there are 569 cape and bottlenose dolphins living in Kinko Bay off Kagoshima. Information and Orientation: Kagoshima spreads on the west side of Kinko-wan Bay. Sakurajima lies on a peninsula on the other side of the bay. The main places of interest to visitors are: 1) the Kagoshima station area, with a fair number of hotels; 2) the Tenmonkan entertainment district; and 3) the water front area with ferry port, gardens, parks and hotels and the Kagoshima Aquarium. There are tourist offices at Nishi-Kagoshima station (☎ 099-253-2500) and JR Kagoshima station (☎ 099-223-5771). Kagoshima has an extensive streetcar system, For destinations that can’t be reached by street car there are buses and taxis. Ferries run regularly to Sakurajima. Entertainment and Shopping: The neon-lit Tenmonkan District is the center of Kagoshima nightlife. It is filled with restaurant, shops, designer stores and sweets shops. Many of the restaurant have special lunch deals. At night, the streets and arcades are lit up with neon lights; restaurant have all you can eat deals; and karaokes and izakaya bars do good business. There is a lively morning market, with locally-grown produce and locally-caught fish, in front of Nishi-Kagoshima station everyday except Sunday. Kagoshima Aquarium (on the waterfront) is large complex with a 1,500-ton tanks with a whale shark, tuna, rays and others fish: an Underwater tunnel; sea otter tank; mangrove tank; a small cramped indoor dolphin pool; and a pirarucu tank, with giant Amazon fish. It opened in 1997. Other Sights in Kagoshima include memorials to St. Francis Xavier, scattered through the city; Kotsuki-gawa, riverside promenade path popular with walkers; and Shiroyama Park, a wooded park on a hill in the center of the city with splendid views from the summit; the Kagoshima Tropical Vegetation Park, with orchids, ferns cacti, palms, macaws and other birds and plants. There are some museum, temples, shrines, amusement parks and an animal park. The Museum of Meiji Restoration and Hometown Museum of Archeological History are worth a look if you are interested in Japanese history. The Kagoshima City Art Museum contains works by Cezanne, Renoir, Picasso, Rodin, Maillol, Kiyoteru Kuroda, Takeji Fujishima and Seiji Togo. An hour away from Kagoshima is Gold Park Kushikino, where visitors can try panning for gold. Kagoshima Hot Springs: There are more than 2,000 hot springs in the Kagoshima area. Some are located on the mountains. Some are in the city. Other are near the sea. Most are inside hotels and onsens. There are outdoor hot springs at the foot of Sakurajima. The nicest one, Furusato Hot Sringm has a variety of baths including a large bath for men and women---where bathers cover themselves with towels---next to the sea. Sakurajima Magma Hot Springs is famous for its "magma mud bath and massage." Shirahama hot spring features rust-colored iron-laden water. Sakurajima (across Kinko-wan Bay from Kagoshima) is regarded as one of the world’s most active volcanoes. It belches out dangerous gases and produces ash showers on a regular basis that cover Kagoshima in a snowfall-like blanket of gray. 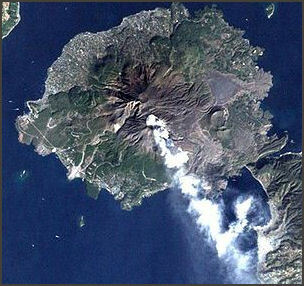 Sakurajima has been producing steam and ash almost continuously since 1955. There were major eruptions in 1914, 1915, 1946, 1955 and 1960. Often the eruption are hard to predict. 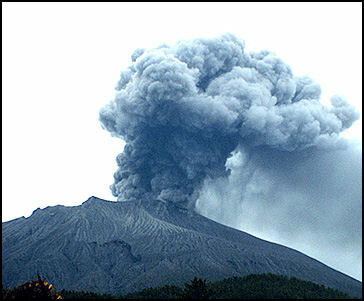 Alerts for a an eruption in August 2008 were not issued until eruptions and pyroclastic flows were observed. Sakurajima recorded 548 eruptions in 2009 and a record 896 in 2010, the most in 24 years. In January 2010 there were more than 100 with some of them sending lava flowing down its sides, shooting ash skyward, and producing purple lightning bolts. Sakutajima erupted 600 times in 2011 as of September. Most of the eruptions have been in the 800-meter-high Showa vent not the larger 1,000-meter-high Minamidake vent. The first record of a Sakurajima eruption was in A.D. 708. The Sakurajima eruption in 1914 was the largest ever in Japan in historical times. That one came as no surprise. The ground around the volcano rumbled for days. In Kagoshima 417 earthquakes were recorded in the 30 hours before the mountain exploded. The eruptions produced 3 billion tons of lava, with lava covering many villages and transforming Sakurajima from an island into a peninsula by filling in a 400-meter-wide, 70-meter-deep strait. In 1987 Sakurajima spewed out molten rock and gases more than 100 times. "It's like a soda bottle with its cap off instead of on," a geologist told Discover magazine. "A small amount of lava is released pretty constantly, rather than a large amount all at once, as at Mt. St Helens." Sakurajima erupts so often that hard hats are mandatory for Japanese students visiting the foot of volcano. Annual volcano drills prepare residents for a disaster. eruption in 2000 Sakurajima consist of three peaks: 1,117-meter-high Kita-dake, 1,060-meter-high Naka-dake, and 1,040-meter-high Minami-dake. Minami-dake contains the crater where most of the volcano’s activity takes place. On the slopes of the volcano are deep layers of lava and ash. In some places there is incredibly fertile soil that produces white radishes that weigh 80 pounds. It is not possible to hike to the top of Sakurajima but is it possible to bicycle around it on a road that follows the coast around the entire peninsula. Stops along the way, include small towns, rock beaches, lavas flows, and hot springs. At Shioyagamoto port the sea is a bright turquoise color because of the effect of microbes feeding on nutrients released by the hot springs. Bicycles can be rented at a shop near the ferry terminal. The bicycles are not in very good shape so be prepared for that. One stretch of the road traverses a A monstrous lava flow produced by the 1914 eruption that buried Torishima Island. The Kurokami Buried Torii is a remnant from before 1914. At Arimura Lava Formation Observatory you can wander around on wooden walkways that winds through lava flows. The Yunochira Observatory is at the top of a steep road, about a third of the way up the western slope of the volcano. The Sakurajima Visitors Center has displays in geology, volcanic eruption and natural history. Although it not possible to climb around the top of Sakurajima you can hike on the lower slopes on hiking trails that lead to lookouts with good views such as Yunoshira Observatory. Kirishima-Yaku National Park (north and south of Kagoshima) is Japan's first national park. Established in 1934, it embraces old pine forests, sulfur springs, 23 volcanos, 10 crater lakes, 15 craters, clear mountain lakes, shrines and mountains. Some scenes from the James Bond film You Only Live Twice was shot in the park. Ebino-kogen (north of Kagoshima and part of Kirishima-Yuka National Park) is popular with hikers and tourists especially in late May when azaleas bloom all over the mountains. Some hikers climb 1,574-meter-high Mount Takachiho-no-mine, a peak on the 10-mile-long Kirishima Volcanic Ridge. According to an ancient myth, Japan and the Japanese people were created on Mount Takachiho-no-mine by the grandson of the Sun Goddess after he descended from heaven. At the summit is an inverted sword which is said to be authentic. 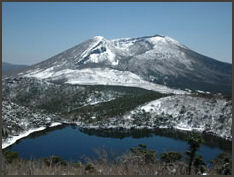 Ebino-kogen village sits on plateau with three crater lakes: Byakushi, Rokukannon and Fudo. There is an excellent hike from Ebino-kogen village across the Ebino-kogen Plateau to 1,700-meter-high Mount Karakuni-dake and from there to smoking 1,425-meter-high Mount Shishiko-dake, 1,421-meter-high Mount Shinmoe-dake, 1,345-meter-high Mount Nakadake, which is not far from Mount Takachiho-no-mine. The Ebino-kogen Plateau contains one of Japan's highest hot spring resorts. Other hot springs and onsens are scattered in and around the park. Some are quite expensive and fancy. Some are rustic and simple. From the top of the mountains you can see Kagoshima and smoking Sakurajima volcano. There are also some waterfalls that attract hikers. Kirishima Shrine was originally built in the 6th century but has been rebuilt many times due to fires and volcanic activity. The present structure was built in 1715, Although it is a Shinto Shrine it has many Buddhist touches. To the right of the main sanctuary is a stone honored in the Japanese national anthem as symbol of Japanese unity. Inside the Chiran Peace Museum Chiran (about an hour south of Kagoshima) is a quiet rural town with well-preserved samurai houses and refined Japanese-style gardens. In World War II, it was training camp and departure point for kamikaze missions. Nearby 992-meter Mt. Kaimondake was used as a navigation reference for kamikaze pilots that took off from Chirancho. Websites: Bill Gordon Wesleyan University Kamikaze Images Getting There: Chiran is accessible by bus from Kagoshima. Peace Museum of Kamikaze Pilots (in Chiran) is a small museum set up near a kamikaze training camp and the take off area for kamikaze pilots who ran missions in Okinawa, and the seas around Japan in World War II. 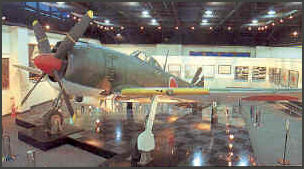 The museum contains models of planes and memorabilia as well photographs of young men who died on kamikaze missions and even some of the last letters they wrote before their missions. The museum is open from 9:00am to 5:00pm. The guided tours are in Japanese. Recorded guides are available in English. Website: www.synapse.ne.jp/"chiran or call ☎ (0993)-83-4313. Ibusuki (30 miles south of Kagoshima) is one of Japan's most famous hot spring resorts. Located on the southernmost tip of the Satsuma Peninsula, this town is noted for its sub-tropical vegetation, white sand beaches and natural hot sand baths which can be taken right on the beach. Ibusuki is filled with modern hotels and traditional inns. The Ginsho Hotel charges visitors ¥710 for the pleasure of being buried in hot black sand heated by natural steam and water from hot water springs passing through the sand. Ibusuki is the only place in the world where you can enjoy this unique experience. Altogether a 16-mile stretch of beach is heated by subterranean volcanic activity. People have been taking the baths for more than 300 years. One person in the 19th century described them as “curing all kinds of illnesses and especially good for muscles and bones.” In the last hundred years they have been commonly used by farmers in the off season. Westerners first became aware of Ibusuki when it was featured in a Life magazine article in the 1960s. One facility today welcomes 270,000 to 300,000 visitors a year, with 80 percent of them coming from outside Kagoshima. These days more and more are coming from South Korea, China and Taiwan. “I lay down as instructed by one of the staff. The staff member, who happened to be a woman, poured sand all over my body with a shovel. All except my head that is. 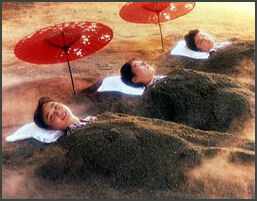 As she chatted about the tremendous beneficial affects of the sand bath, a man laying behind me joined our conversation. Saying that he came to this place regularly and never needed any doctors or medicines. 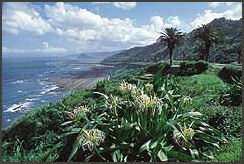 Cape Sata-Mikai is the southernmost point on the main islands of Japan. Lake Ikeda is the third clearest lake in Japan. Formed in a rare double-sunken crater, it is inhabited by massive eels. Graceful 922-meter-high Mt. Kaimon-dake is a volcano with a perfectly-shaped cone.